Queensland owns beaches like Kelly Slater owns surfing. With 84 patrolled swim spots, 25 surf schools, the tallest sand dune in the world, the world’s largest sand island and the most popular beach in Australia, the Sunshine State is just a bit of an overachiever. From dog-friendly and 4X4-able to popular surfing spots, secluded island bays and beaches accessible only by boat – whatever tickles your sandcastle, there’s a patch of sand to call your own. But when it comes to settling on the best beach to lay down your towel, the smorgasbord of choice can become overwhelming. Here are the best of the best to help you narrow down that list and start planning your next sandy escape. A strip of sand separating two UNESCO World Heritage-listed areas (Daintree Rainforest and the Great Barrier Reef), Cape Tribulation is drop-dead gorgeous in a Castaway (minus the scruffy beard and home dental work) kind of way. 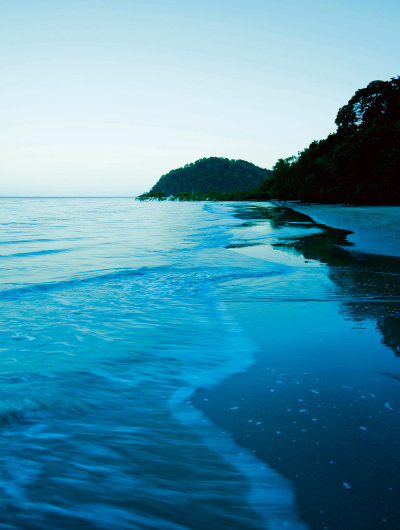 It keeps adventurers satiated with horse riding, kayaking, bushwalks and 4X4ing through the Daintree Rainforest. Magnetic Island has somehow managed to stay relatively off the radar of most travellers, but a quick ferry ride from Townsville will have you experiencing beaches as deserted as they would have been when Captain Cook sailed by in 1770. While Horseshoe Bay is where it’s at, if you’re relying on a two-wheel drive, a 45-minute hike to Balding Bay or Radical Bay will spit you out into a reality far more beautiful than The Beach. Leo DiCapri-who? There’s a reason Whitehaven Beach in The Whitsundays consistently rates as the most popular beach in Australia and makes “best beaches” lists the world over – it’s only accessible by boat or seaplane, so you’re already starting with a rockstar entrance. Add to that four miles of squeaky-clean silica sand and technicolour views and you might just be ruined for any other beach for life. Most people don’t know it, but here there are seven BYO-everything camping sites available to be booked for only $5.75 per person. Dingo Beach is a well-kept secret of mainland Whitsundays locals, who scoot out of Airlie Beach when the crowds get too much. To get there you'll drive along a dirt road, which ends at a coconut palm-strewn stretch of sand overlooking Gloucester Island. Once you’ve had a swim, mosey on over to Dingo Beach Hotel for live music and sundowners. You probably wouldn’t expect a small beach sitting between Cairns and Port Douglas at Palm Cove to punch so highly in the cuisine stakes, but award-winning eateries like NuNu Restaurant work their magic with the local speciality: seafood – and lots of it. Then again, with a view this pretty, even a scoop of gelato eaten on the beach will rock your world. Unsurprisingly, the lagoon and beachfront are the centre of the universe in Airlie Beach. Recent years have seen culinary efforts come up to par with the views here, with gourmet cafés like Mr Bones and craft beer and tapas haven Denman Cellars giving the town a much-needed injection of sophistication. Noosa could arguably be credited with inventing beachfront café culture in Australia, and its annual food and wine festival attracts the food world’s biggest hitters. Hastings Street is its cosmopolitan backbone, where cyclists people-watch over their flat whites from a well-placed chair at Aromas. But it’s not just food on the menu in this town, with annual arts and jazz festivals, TED talks and even a body-art festival complementing the lycra-laden sporting events calendar. The hipster to Noosa’s style set, Burleigh Heads continues to grow and infiltrate the backstreets, so now chilled-out cafés play alongside beachfront fine dining, and fortnightly local designer markets provide a retail hit. However, grabbing take-out and nabbing a patch of grass on the headland to watch the surfers in the rolling sets below still rates highest in most people’s books. Back on the Sunshine Coast, Mooloolaba has always been a popular beach getaway, but now that the latte-toting, green juice-sipping crowds have descended, the beach almost plays second fiddle to the café scene. Chews and views? Yep, it’s got the best of both worlds. The 1.3-mile beachfront promenade that is The Strand in Townsville packs a whole lotta punch into a day at the beach, with barbecues, picnic tables, stinger nets, a free waterpark, monthly night markets and the biennial outdoor sculpture exhibition, Strand Ephemera. You can also watch elated skydivers land on the beach. 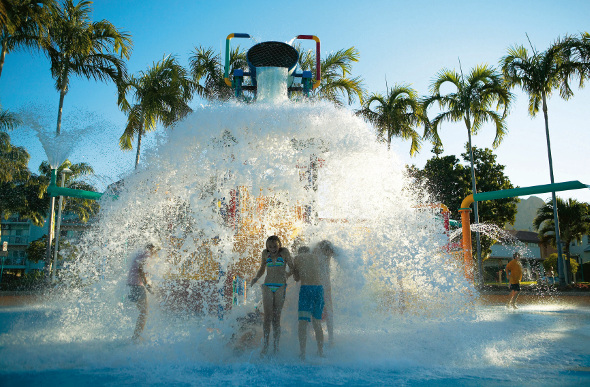 Further south, the quintessential beach holiday town of Caloundra on the Sunshine Coast hasn’t changed a whole lot since the 1950s, and that’s a very good thing. The calm waters of Bulcock Beach, Currimundi Lake and Golden Beach are perfect for the wave-phobic, while the fountains, playground and ocean pool at Kings Beach provide an interlude between stints in the surf. Suttons Beach in Redcliffe is one of those places you’ve never heard of, but once you arrive you wonder how on earth it managed to stay off your radar – especially since it’s only 40 minutes from Brisbane. Parking spots? Check. A fenced playground? Check. Patrolled beach and fish’n’chips? Sorted. At low tide, spot soldier crabs and grab a shady gazebo for your BYO barbecue. Yes, it’s man-made, but Streets Beach at South Bank in Brisbane can claim the title of the only CBD beach in Australia, and has the advantage of a lifeguard on patrol, shady trees and picnic spots, cafés and market stalls on tap – and the performing arts and museum epicentre is just a few minutes’ walk away. So when the kids start resembling a pack of raisins, you can go straight from beach to theatre. 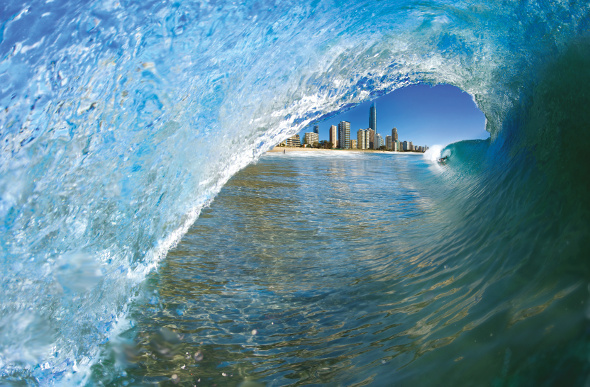 It’s no secret that the Gold Coast is a surfing haven. From Duranbah Beach in the south to Main Beach in the north, pros and L-plate surfers all converge on this stretch of coastline in search of the perfect wave. While debate rages over whether D-Bar sits in Queensland or New South Wales, all you need to know is that it consistently serves up throaty barrels and hairy rips, so you need to be on your A-game. The Superbank – a 1.2-mile chain of breaks covering Snapper Rocks, Rainbow Bay, Greenmount, Coolangatta and Kirra – provides a conveyor belt of peeler after peeler. And even if you’re not a surfer, this is the best spot to get your stalker on (pros Mick Fanning, Joel Parkinson and Stephanie Gilmore are often spotted here) and check out the annual Quiksilver and Roxy Pro events. While Surfers Paradise might sound a little too literal to be true, this beach break is still a hot favourite, especially with surf schools. But head a little further north to Main Beach and you’ll score consistently fun waves with less people to compete with. Up on the Sunshine Coast, Noosa surf is a tale of two mistresses. When small swells are running, the waves peel along the rocks in a rhythmic fashion so you can hang all ten toes off the nose, but when the swell is overhead, the protected bays deliver the goods. A few beaches south, Coolum’s got plenty of consistent peaks to hone your skill. And further south again, Kings Beach is protected from northerly winds, making it a favourite in summer when the rest of the beaches are blown out. Brisbanites may not have any surf, but their closest wave playground of North Stradbroke Island more than compensates with the types of waves that attract pods of dolphins and turtles riding in on the EAC (East Australian Current, dude). Main Beach is the most consistent (its punchy beach breaks giving rise to Bede Durbidge’s career), and when cyclone swells come rollin’ in, Cylinder Beach is where you want to be. With epic surf, the Great Barrier Reef and ocean massages on the menu, a Queensland island escape can mean so much more than swaying palm trees and white-sand beaches. Besides the blockbusters everyone knows about – One & Only Hayman, Hamilton, Fraser, we’re looking at you – there is a surprising number of islands that provide the kind of untouched beaches travellers are happy spending thousands of dollars to reach. The totally uninhabited Frankland Islands are a well-kept secret off Cairns, and only one operator takes a maximum of 100 day-trippers over. 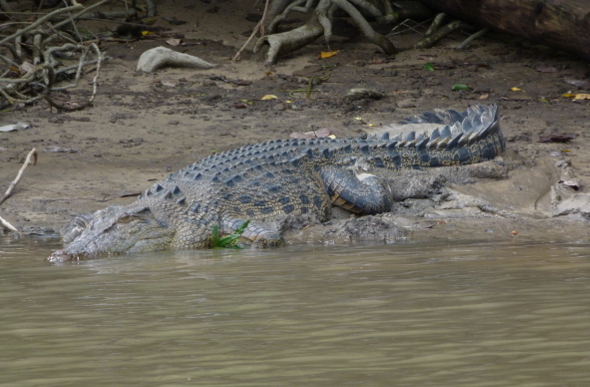 Expect sugary-white sand, snorkelling right off the beach and croc spotting on the trip back through the mangroves of the Mulgrave River. 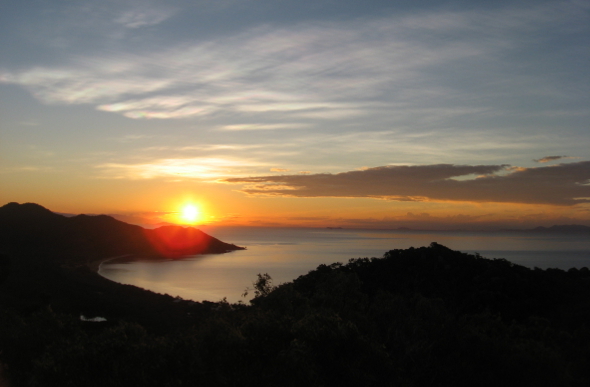 Keswick Island sits pretty off the coastline of Mackay with no resorts, no crowds and no cars. Though you’ll need your own boat (or a wad of cash for a flight over from the mainland), once there you can expect complete isolation on the five sandy beaches, koalas blissing out in the trees above and million-dollar views for days. The Southern Great Barrier Reef may already be on the radar of nature lovers and scuba divers, but Heron, Wilson, Lady Elliot and Lady Musgrave islands remain relatively anonymous when it comes to best beach lists. If you like the idea of stepping off the sand into an underwater wonderland where resident manta rays, turtles and more than 1,200 species of marine life are ready to play, the beaches here won’t disappoint. But if your idea of paradise is a long stretch of sand, calm warm water and not a soul in sight, Great Keppel Island beckons. A 30-minute ferry ride from the mainland will bring you to 17 beaches that showcase nature in its most raw state. 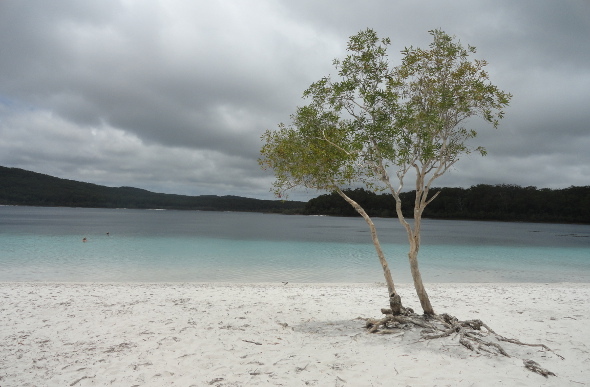 Being the largest sand island in the world, you’re never going to be left wanting for beaches on Fraser Island. With rainforests sprouting from sand, freshwater lakes, shipwrecks and dingoes, the beach experience here is as rugged as it is epically beautiful. North Gorge Headland Walk, North Stradbroke Island. Short and sweet, this 0.7-mile walk offers whale spotting between June and November. Noosa National Park, Sunshine Coast. Look up to see koalas in the treetops and stop at each bay to snap photos, or take the cooler rainforest tracks. Greenmount Beach to Rainbow Bay, Gold Coast. 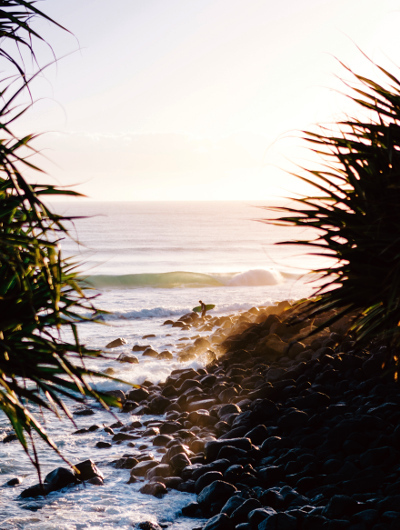 Walk past famous surf breaks and continue up to Point Danger, where you can plant one foot in Queensland and the other in New South Wales. Caloundra Coastal Walk, Sunshine Coast. Wrapping its way from Golden Beach to Currimundi Lake, this walking track and boardwalk (in places) serves up beaches, cafés, lookouts and a good workout to boot. Carlo Sandblow, Rainbow Beach. A 0.7-mile walk from the beach will put you at the car park, and another short 600 metres will see you face to face with the wide expanse of the Carlo Sandblow and its epic coloured sand cliffs. Forts Walk, Magnetic Island. A 90-minute round trip best done in the early morning or late afternoon for koala spotting, 360-degree views of the Coral Sea and a WWII history lesson. 75 Mile Beach, Fraser Island. Keep a watch for planes and dingoes as you burn along this beach highway that doubles as a landing strip. Noosa to Rainbow Beach. Cross over to Noosa North Shore via the car ferry at Tewantin and take the scenic route past Teewah Beach, Double Island Point and the coloured sands to Rainbow Beach. Moreton Island. The beach is the highway and the sand tracks the backstreets when you’re on Moreton Island – it’s 98 percent national park and can only be traversed by 4X4.